If you would like to delete your Leanpub account, please signed in to Leanpub and go here: https://leanpub.com/user_dashboard/admin. You can find that page by clicking on the avatar image at the top right of any Leanpub page (when you are signed in), clicking Profile, and then in the navigation bar at the top, clicking on Profile and selecting Admin. 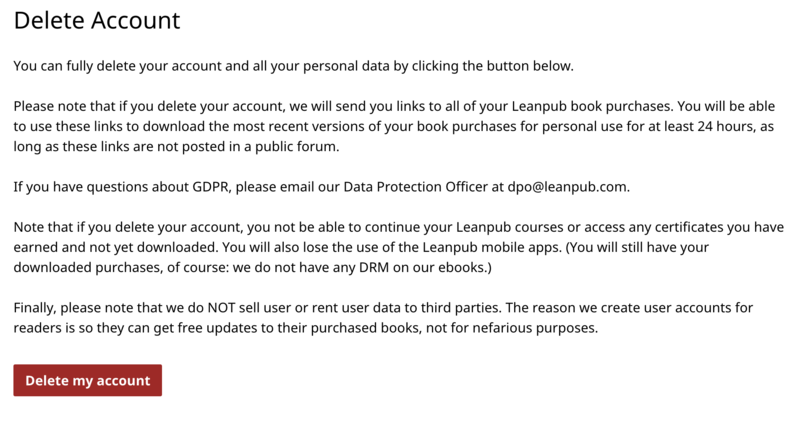 Alternatively, you can email an account deletion request to us at hello@leanpub.com. Be sure to email us from the same email address used for the account, so we can verify the deletion request is coming from the person the account belongs to.